This was an information packed episode. We learned the story behind the rivalry between Hook and Ursula. We found out the exact details of Rumple’s ultimate plan. More of the author’s capabilities were revealed. We also learned where the author actually is being kept. And we lost a Queen of Darkness when she got her happy ending. The main story of this episode was the backstory behind why Ursula hates Hook so much. At one time Ursula was a mermaid and she had voice that was powerful and could make people forget their pain for a time. She was a woman who didn’t understand her father’s hatred of humans and pirates. She was kind hearted and sympathetic towards people. She stole a bracelet that let her have legs and allowed her to see the human world. She met Hook and befriended him. Hook took sympathy on her. He saw a kindred spirit and understood her pain. (Important note here: Hook was not a cold hearted monster when he was villain. He still felt for people and wanted to help those that he understood.) Ursula’s father doesn’t want her anywhere need humans and in the end he forces Hook’s hand to betray Ursula. Poseidon threatens Hook’s revenge plan and he ends up having no choice but to hurt Ursula. It is this moment, Hook stealing her voice and her father being part of the whole thing, that sent Ursula over the edge. It is important to note here that Ursula was not born evil and cruel. Just like all our other villains her life circumstances and her choices in response are what made her a villain. One of the main elements of this show that I like so much is that the villains are never born. Not one of them has been evil from the very beginning of their lives. Every one of our villains was created by what happened to them in their lives. They lost someone or something and that sparked a retaliation element in them. It all comes down to the choices they made when they were hurt. They lashed out, blamed one person and became full of revenge. A villain is never born they are made. A villain comes out because of the choice someone makes when they are faced with a hard and difficult situation. Hook tells Emma that working with Ursula made him remember his past and he felt himself falling back into his dark choices. It scares him. We see that Hook betrayed Ursula because he was terrified that all his work to get back at Rumple was going to end. Hook made a poor choice then, all fueled by anger and hate. That was the past Hook though, it is not the man that loves Emma. 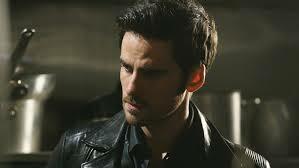 Our Hook has to remember that he is not his past. Everyone has a past with poor choices that they do not ever want to repeat. Present Hook is not that man. Yes, he did make a promise to Ursula he could not keep but instead of lashing out, he attempted to fix his mistake. Hook found Poseidon and brought him back in order for him to return Ursula’s voice to her. Hook made a mistake, understood what he did and rectified it. That is what matters now. Hook is so afraid of losing his happy ending, (Emma), that he is too concentrated on what he did at one time. Just like Emma told him before he had a past but that is not what matters now. If he continues to live as he is, striving to do good and fixing mistakes when he makes them, he will be fine. Ursula not only got her voice back but she always got her father back as well. Without the author rewriting her story or altering the storybook in anyway Ursula got her happy ending. What I found interesting here was that no one seems to have realized just what this could mean. The author is not needed for these people to get what they want. (Essentially they are the authors of their own stories). It all comes down to the choices they make and the choices of those around them. Hook and Ursula worked together, and in the end Ursula got what she wanted. This has an interesting implication for the whole ordeal they are working in right now. A happy ending is possible if you work toward it, forgive those who hurt you, right your wrongs and make the right choices. I wonder if anyone is going to realize what happened with Ursula and if it will make them doubt their whole plan. As part of their deal Ursula gave Hook the information about Rumple’s plan. It turns out that while Emma is around the author cannot rewrite the storybook and give anyone the ending that they want. How Rumple learned this information we are not told, yet. Emma is the one who has been giving people their happy endings, or at least helping them work towards them. The author cannot undo the work she has done. Rumple’s plan is to consume Emma’s heart with darkness. If Emma is not the savior then the author can rewrite the stories. Why this is I am not positive yet but I am sure we will get more information soon. Turning Emma dark is the ultimate goal for this plan. How Rumple plans on doing this I am not positive yet. But right now I can tell his work may not be that hard. The previews next week show that we are going to learn more about what Snow and Charming did to Maleficent. It also appears that Emma learns about her parents lies. Emma is being held together by her parents, Hook and Henry. If these strings start to unravel Rumple will not have to do much to turn Emma. As I said earlier all the villains are turned evil by the circumstances around them and the choices they make in response. Emma is going to have to make some tough choices soon. She is going to have to not let her anger and pain rule her actions or else she is going to turn dark without much effort. Emma is already teetering on the edge. Snow and Charming are her guide to choosing correctly, so when she sees that they aren’t perfect she is going to lose it. I hope that Hook can keep himself together because I have a feeling he is going to have to be Emma’s voice of reason soon. “You finally chose the winning side,” – Rumple- This is what Rumple believes. What is interesting is that Ursula got her happy ending without Rumple. He did not have a hand in her getting what she always wanted. So what does this say for the other Queens and Rumple getting what they want. “Even when I think he can’t deceive me anymore, he finds a way,” – Belle- Belle learned about Rumple’s betrayal and him stealing the dagger. Now that he knows that he yet again tricked her, there is no hope left for these two. How will Emma learn about her parents lies? Will it be from them or someone else? Can Hook live in his present and stop defining himself by his past? Will the other two Queens get their happy endings as well leaving Rumple all alone? How did the author end up in the book? Was it to hurt him or her? Or was it protect him or her? Why does turning Emma dark allow the author to change the stories? What does this imply about the extent of Emma’s powers? Is Maleficent’s child still alive? Do we know him or her? Is Emma some new type of author? Will she be given that power before the season ends? What is Rumple’s happy ending? When is Robin Hood coming back? What did Regina’s dream mean? Why is her past self protecting Robin? What does that mean for her present time? Does it imply that present Regina trying to change her story is going to ultimately hurt Robin somehow? When will Regina’s double agent role be revealed? How? Posted on March 23, 2015, in Once Upon a Time, Tv Shows and tagged 4x16, Emma, Happy endings, Hook, Once Upon a time, Poor Unfortunate Soul, tv show review, Ursula. Bookmark the permalink. Leave a comment.